Many shows most definitely did not stand the test of time (I’m looking at you, Shirt Tales). Gummy Bears has the best theme song for a cartoon. Ever. Muppet Babies totally appeals to current day 5 year olds. C was engrossed and watched 4 episodes in a row. I didn’t say we had a productive day, just a nice one. 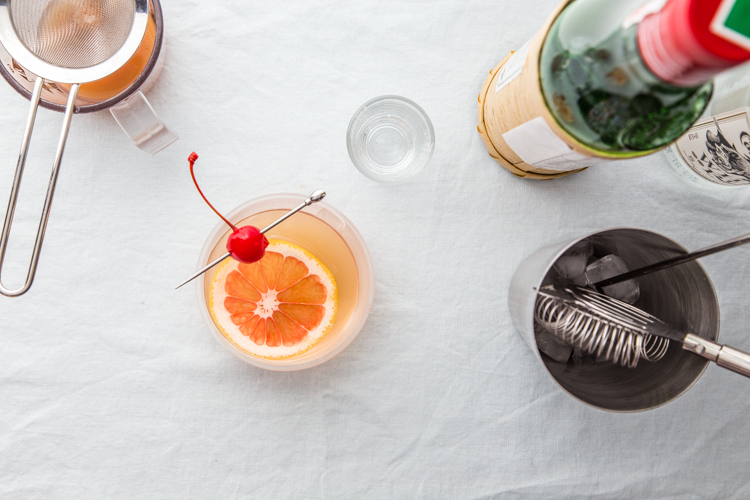 Switching gears, you may have noticed that I haven’t had a new cocktail recipe up in 2 weeks. Well, this Broiled Grapefruit Daiquiri was slated to be last week’s edition of Cocktail Friday, but it needed another a bit more tweaking. Now it’s just what I was hoping for and therefore, ready to share. I was inspired to make this cocktail from two different recipes, the first being this Rum-Broiled Grapefruit recipe from Saveur. 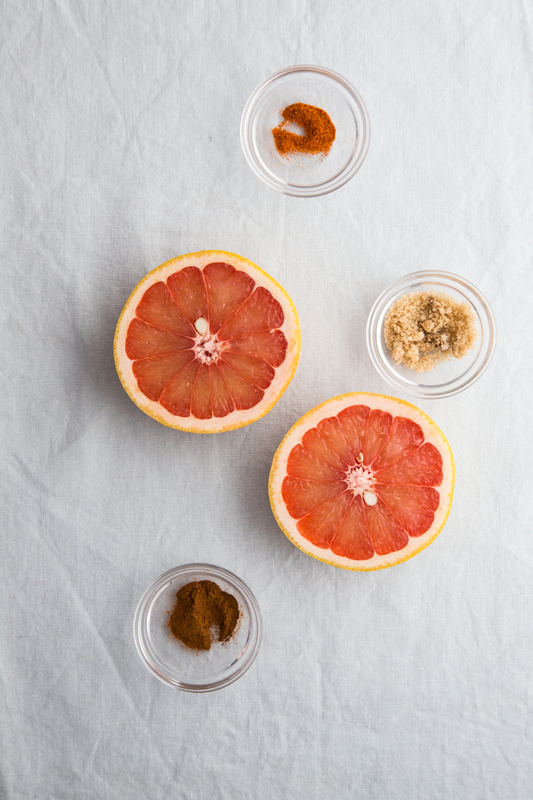 I love how they incorporated some sweetness (brown sugar) and spice (cinnamon and cayenne) into the broiling of the grapefruit. For my cocktail, I eliminated the brushing the grapefruit with rum, knowing that I would simply use the rum in the actual cocktail. 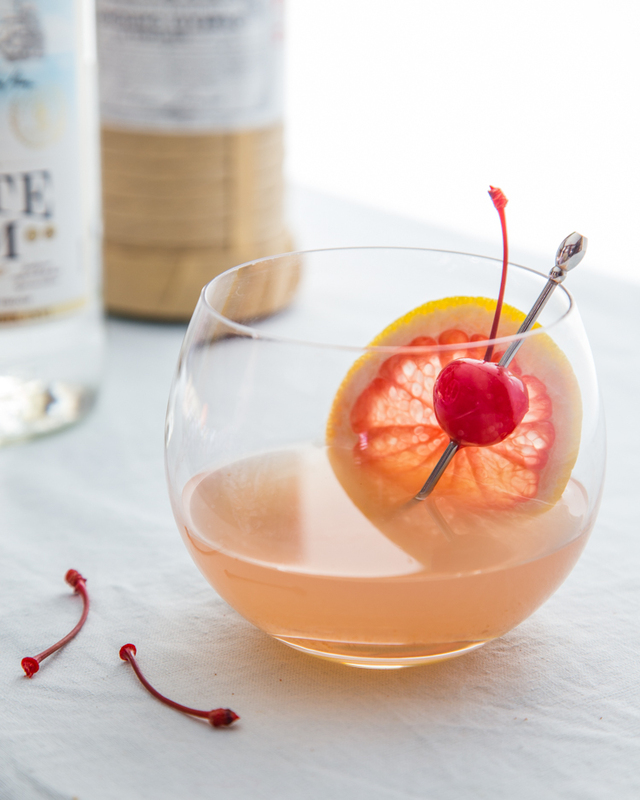 The cocktail itself was inspired by this pink daiquiri recipe, which is a pretty classic drink. You can find similar recipes all over the internet, however, you will be so pleasantly surprised at how adding the broiled grapefruit juice to this drink deepens the flavor beautifully. 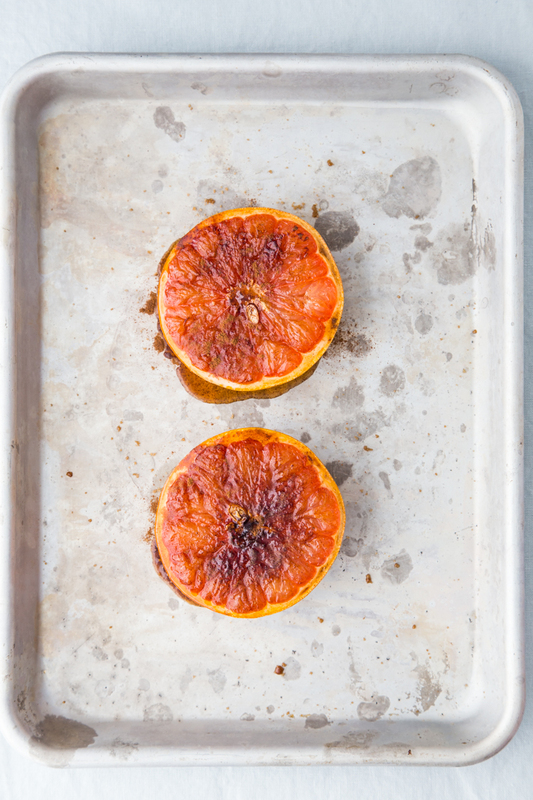 Watch the broiling grapefruit carefully to be sure that the sugar doesn’t burn. You want a good caramelization, but not a char. Allow the grapefruit to cool for a bit before trying to juice it – I was a bit to eager to get moving on this step and learned the hard way that the broiler can make the juice of the grapefruit quite sizzly in a very short amount of time. I tried shaking and stirring this cocktail, and found that the stirring resulted in a better mouth feel (I hate that term, but honestly, it’s what it was). Double strain! Use a straining and pour the cocktail through a fine meshed sieve as well. It makes sure all of the little grapefruit bits don’t float around your lovely blushing cocktail. This cocktail is really quite surprising in it’s depth of flavor. My husband and I both loved this drink and it will be one we’ll be making again soon. It’s a bit more involved than some of the other drinks I make, but one of the steps are difficult. It just takes a bit of planning, but honestly, not much. Plus, it’s totally worth it. 2. Place grapefruit on a rimmed baking sheet, cut side up. Sprinkle evenly with brown sugar, cinnamon and cayenne pepper. Broil for about 4 minutes or until sugar is bubbling and the grapefruit is fragrant. Allow fruit to cool. 3. Juice grapefruit. Strain through sieve to remove solids. Use a spoon to press out as much of the juice and spice as you can through the sieve. Store extra juice in the fridge. 1. Fill a Boston shaker with ice. Add rum, broiled grapefruit juice and maraschino liqueur. 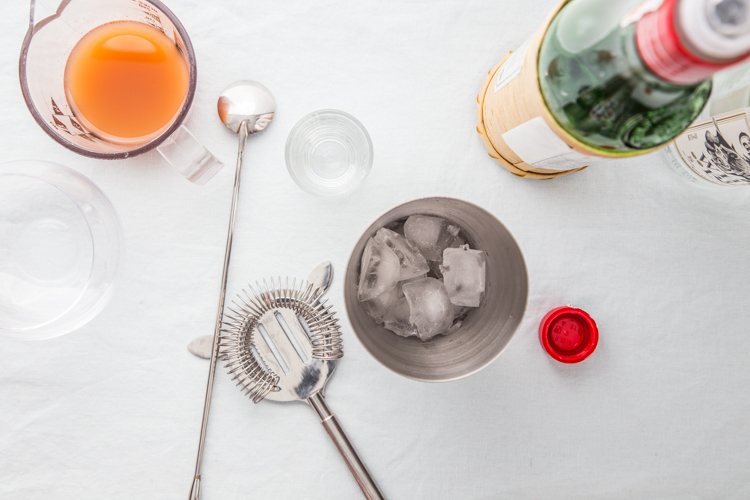 Stir with a cocktail spoon until chilled. Double strain into cocktail glass. 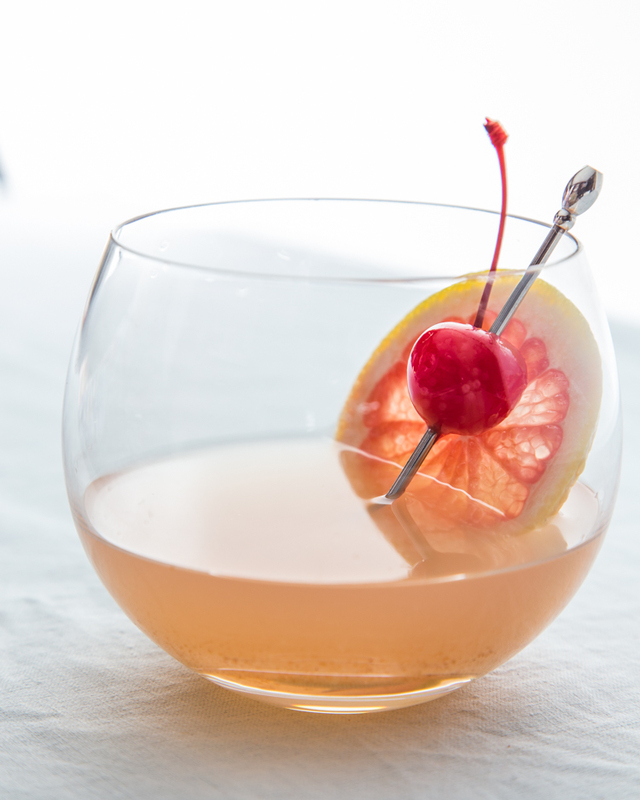 Garnish with grapefruit slice and maraschino cherry. Watch the broiling grapefruit carefully to be sure that the sugar doesn't burn. You want a good caramelization, but not a char. Allow the grapefruit to cool for a bit before trying to juice it - I was a bit to eager to get moving on this step and learned the hard way that the broiler can make the juice of the grapefruit quite sizzly in a very short amount of time. I tried shaking and stirring this cocktail, and found that the stirring resulted in a better mouth feel (I hate that term, but honestly, it's what it was). Double strain! 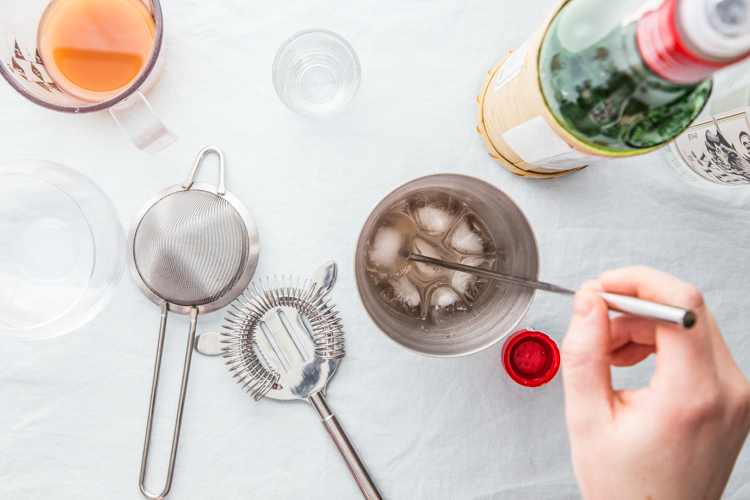 Use a straining and pour the cocktail through a fine meshed sieve as well. It makes sure all of the little grapefruit bits don't float around your lovely blushing cocktail. I love the flavors of this! Even the cocktail is super bright and sunny! What a gorgeous cocktail, the color is so pretty! These photos are gorgeous and this drink looks amazing! I love anything with grapefruit.